“Well, nobody else in this shop would really recommend that ride. But it's kind of a classic. You'll get sand in your shoes,” said the older guy in the shop. For some reason, out here people seem a little hesitant to recommend rides that aren't flowy, manicured, resort style trails. Flowy stuff is fun, but after a couple hours, it all feels the same. A flow trail in Colorado rides the same as a flow trail Indiana, which rides the same as a flow trail in Pisgah, which rides the same as a flow trail in Central Pennsylvania. Rocky trails are all unique- they're a product of an area's geology, past glacier grinding, and climate. Slimy limestone rides completely different than dry sandstone. That variation at every trail system is what I really dig about mountain biking. Smashing through rocks all day at four miles an hour makes me happy. Anyway, I'll get off my box of hippy Castile soap. There's some rock in the desert. I like it. The jeep routes on Poision Spider Mesa aren't the best riding from a singletrack-centric perspective. But they were totally worth it for the views- endless slickrock, fields of rock phalluses, and the snowy La Sals to the north. There was lots of sand, but on the Krampus with big 3.0 tires I was able to ride most of it. At some point my iPhone, which I was using as a camera and GPS, suddenly went from 50 percent battery to nine. Then I took a picture, and it turned off. Which made me get lost for a couple minutes. I was way out on the Golden Spike Jeep route, which is apparently less traveled, because it doesn't have any black tire marks across the slickrock like Poison Spider. The route is only marked by faint dabs of white paint, which are hard to follow when the rock is dotted with little piles of white snow. Losing the GPS wasn't a huge deal, because I did eventually find my way back to the route. But it does annoy me that the iPhone failed so easily. It's such a great and capable device, but in temperatures under 40 degrees, it's close to useless unless I keep it in a pocket and only expose it to the air outside for a minute at a time. Under 20 degrees, and it shuts off even in my pocket. After a couple miles came across some Knard tracks. “Oh weird- there's another guy on a Krampus out here,” I thought. Then I recognized a rock ledge. Somehow I'd managed to double back on myself. A kaakaaw echoed through the canyon. I looked up at two hawks fighting. The air was so quiet and still that I could hear their wings beating, then gliding, talons clicking, even from a few hundred feet below. I really did have the place to myself. After I rode back through the alternating sections of sand and slickrock, Colleen and I headed back to camp, and grilled some chicken sausages. 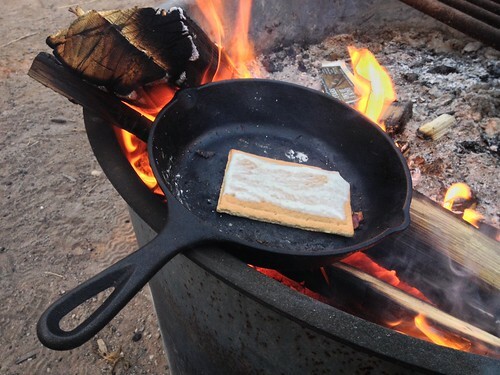 And poptarts for desert dessert. 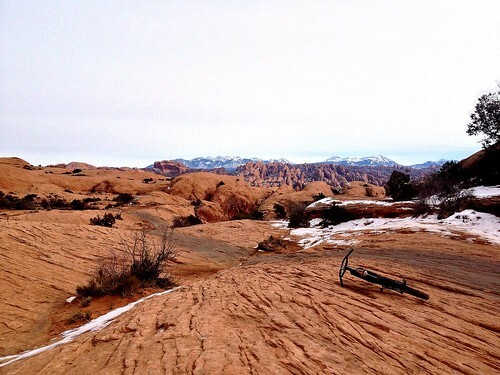 The next day, I headed up Amasa Back and rode the new Captain Ahab Trail. It was extremely excelent- more on that later in the week. Dead Horse Point added new trails and completed those at Thanksgiving. You might try them the next visit. Last year was terrific year to pedal the 4WD routes in winter. Had the desert to myself, the snowy roads were the perfect pack and the surroundings unbelievably sparkly. As winter wore on, I began to recognize fat bike tracks veering to tackle bike trails off of the 4WD road. Must have been locals to be able to follow the route, otherwise covered in snow. And again just the right depth to be a challenge and do – able.